Like zombies, I'm back from the dead. Like zombies, I’m back from the dead. End Night is an experiment into the effects of player traumatisation. When the player isn’t being attacked from all directions and clumsing around like a spaz, the whole experience is whittled down to nothing more than “Fetch-Quest the Virus Sample” for the entire game duration. It must be the difficulty and the rate at which you earn experience that makes the game worth it. Or perhaps that open-ended false sense of freedom that you somehow profess to having had once you put the game down. When you die, you know that it can only be through you having made a stupid momentary fleeting split-second mistake. You won’t be quitting the game in a blind rage; instead, you’ll restart even more determined that you’ll never make the same mistake again. The feeling I instantly felt when I began playing End Night was that I was playing a cross between traditional top-down RPGs like Ultima VI and the most recent Alien Breed titles, such as Alien Breed: Evolution. 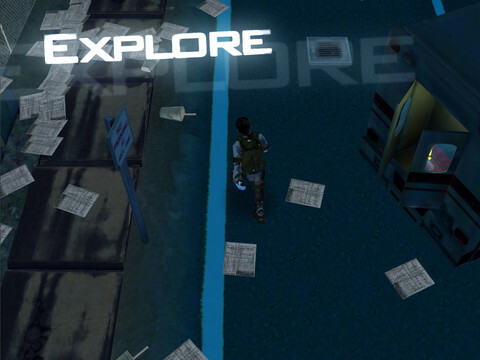 Despite reminding me of games with an emphasis on combat, attacking with guns isn’t the most viable option here. You’re better stockpiling the ammo for those occasions when you might trigger an alarm. Well, until you level up your pistol accuracy, because after that you’re the Glock Demon who never misses a head-shot. You earn points by collecting objects, examining things and completing goals. These points can be used to level yourself up, which is a necessity because it only gets harder the further you go on. One of the things that really pleases me about End Night is that the game is partially randomized. 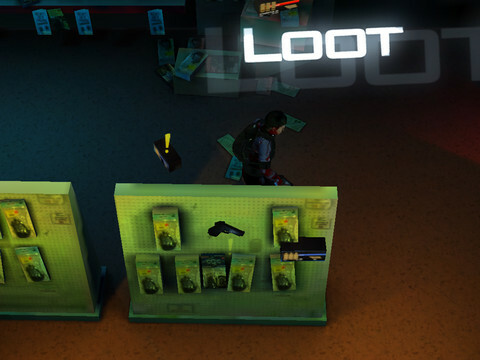 A lot of the items will appear in a different location every time you play. The samples you need to collect and in what order you need to collect them also changes. This makes every play experience a different one and it keeps you on your toes. To draw a parallel, it reminds me of Left 4 Dead‘s AI Director feature. With the flow being controlled by this metaphysical director, you cannot simply rush through the game. This isn’t some mindless bird launcher. Well, not that mindless. You will have to run through the tutorial steps each time, but they only take a short moment to plow through. After that you’re free to run around doing all those fun things I’ve always wanted to do since Van Buren was cancelled. Part of me doesn’t want to believe the game looks this good. The graphics are very detailed, running smoothly with zero lag or tearing. Sometimes the screen can be quite dark and the angle can obscure the game area (such as when walking into the gun shop). Despite this, End Night remains a pretty game, at least when you can see the darned thing. I really like the design of the undead who are attacking you. 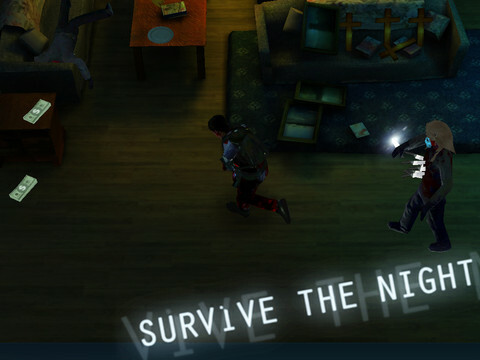 Each zombie wears a blue mask and appears to have knives inserted in its torso. This design is too awesome. You don’t really get to see much of them anyway because you’re too busy panicking as soon as you see them. The hectic, frenzied moments are the best in the game, hands down. I want to keep this short, so let’s cut to the (undead) chase. The key to creating a game for this platform is to make it as compelling as it can be, and I’d say that End Night is pretty compelling. The difficulty really makes it all that it is. On that verge of hard but fair, which makes it all the more enjoyable. This game is definitely worth a look if you’re trying to justify having bought an iPad. 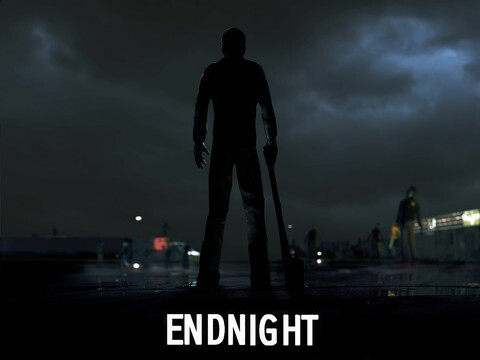 End Night is a suspenseful and hectic game that combines elements of the best survival games together and ends up being above average. End Night is available to purchase on the AppStore. A copy of this game was provided by the publisher for GameCola to review.